This is one example of a Skid for preparation of a food sauce. 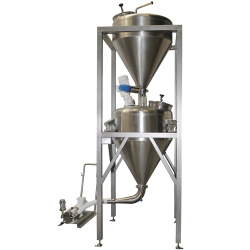 The upper tank is designed for storage of the powder and it is supplied with an automated butterfly valve with C-TOP. The powder is dosed into the lower tank, equipped with a BFR agitator and an inlet for water supply. At the bottom of the lower tank there is a drain valve connected to an SLR rotary lobe pump. The preparation tank is supplied with a weighing system. Both tanks are provided with spray balls and a HYGINOX pump for CIP. Request a Call Back to find out more about our full offering for the Food and Beverage Industry.